Put on your flat cap and do some crimes. Peaky Blinders, the BBC period crime drama, is getting a game adaptation for PC and consoles. 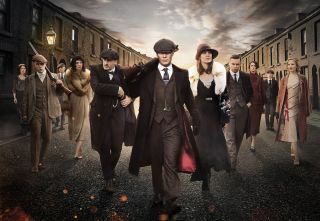 The show stars Cillian Murphy getting up to no good in Birmingham during the 1920s, and it's managed to remain popular enough to get to season five. There's even an IPA, if you fancy drinking Peaky Blinders instead of watching it. Publisher Curve Digital and developer FuturLab are putting the gangster romp together, which will apparently feature an 'innovative' story-driven design where you'll be able to play as various characters as you explore Peaky Blinders' digital Birmingham. Details on the adaptation are slim and I confess that, of the four episodes of the show I've watched, I've retained very little. I remember Cillian Murphy's very sad eyes, too many flatcaps and, oh yeah, Sam Neill's in it. Not remembering much of the show won't stop me speculating, of course. A narrative adventure seems likely, but who knows—maybe we'll get a Peaky Blinders tactical RPG? Manage and nurture your gang, fight the law, break into places in turn-based heists. I would definitely play my made-up game. Peaky Blinders is due out in 2020.